Auto glass is an important structural component of your vehicle, so a quality installation is important for your safety. Allstate Auto Glass Inc. has the parts and experience to properly replace auto glass on virtually any car or truck. With our convenient mobile service, you won’t have to take time out of your busy day to have the work done. Our mobile service is fast, safe, and at no extra charge, we can meet you at your home or office. We vacuum your car, cover the seat, and inspect the vehicle before and after the job is complete. Allstate Auto Glass Inc. has been in business since 2000 and has experience for both personal automobiles and company fleets. 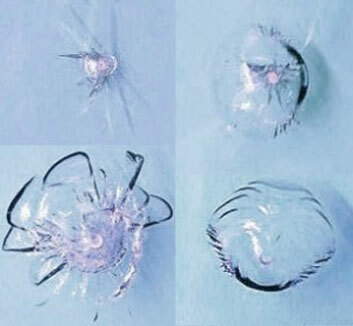 Do you have cracks like these in your windshield? f you do, don’t wait until it spreads and can’t be repaired. A windshield repair will not completely make it disappear, but it will improve the view through your glass by around 70%. We recommend a windshield replacement for damage directly in the driver’s view. All windshield repairs are guaranteed to maintain integrity for years. If any problems occur, we will credit your windshield replacement by the amount of the failed repair. In some cases during the repair process, the existing chip may spread into a non-repairable crack. Allstate Auto Glass cannot assume any responsibility for this scenario. High Quality – manufactured in the USA using high-end CNC equipment.